The Blame Game: Are School Problems the Kids' Fault? Free Shipping & Autographed Books - Sale Ends Dec 20! In this issue of The Special Ed Advocate, we look at school culture, conflict, evaluations and evaluators, and offer tips for taking care of yourself. Download printer-friendly version of this newsletter To subscribe, unsubscribe, or change your email address, please follow the instructions at the end of this newsletter. Flyers! Download a two-page flyer of free online newsletters and journals about education, special education and advocacy. 1. The Blame Game: Are School Problems the Kids' Fault? Many parents of special ed kids say that they are blamed, intimidated, and made to feel guilty by school personnel. Like Emory and Elaine Carter, these parents feel helpless, frustrated, and defensive. In "The Blame Game," you learn the five reasons why kids have learning and behavior problems, what school psychologists do not tell parents, and what you can do about it. Learn about school culture, evaluations & evaluators, and how to negotiate with the school in The Blame Game: Are School Problems the Kids' Fault? In Wrightslaw: From Emotions to Advocacy, you learn about gatekeepers, special education teams, and one-size-fits-all programs (Chaper 4). Learn about obstacles to success, including myths, rules and school culture, personality styles, how to deal with difficult people, and steps you can take to minimize or resolve problems with the school (Chapter 5). Learn why parent-school conflict is normal, predictable, and inevitable. You learn the most common reasons for conflict, and strategies you can use to resolve conflict (Chapter 6). If you are like many parents, emotions are your Achilles heel. Learn how routine problems can erupt into crises, common pitfalls, and steps you can take in a crisis to improve the odds for a good outcome (Chapter 7). Learn about the FETA book (scroll down to "How the Book is Organized"). Learn about evaluators and educational consultants in Your Partners: Independent Evaluators and Educational Consultants. 4. Free Shipping & Autographed Books - Sale Ends Dec 20! Do you know someone who is passionate about special education advocacy? Do you know someone who would like a personally autographed Wrightslaw book? Are you looking for a unique holiday gift? Order any Wrightslaw book and get free shipping - save $4.95! 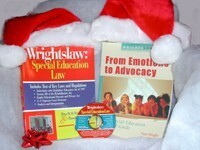 Wrightslaw books make great gifts for friends, teachers, and child advocates! Your autographed book will come in a special holiday gift box. Order now - this offer ends on Friday, December 20! 5. Using an Expert as an Effective Resource by Jennifer Bollero, Esq. Why do parents need experts? How should parents choose experts? In "Using an Expert as an Effective Resource", attorney-author Jennifer Bollero explains why parents should rely on advice from trained professionals to make informed decisions about educational interventions. "No matter how knowledgeable they are about their disabled children, parents should rely on the opinions of trained professionals to help them make informed decisions about therapeutic and educational interventions." Learn why medical experts should advise parents to seek the best medical and therapeutic treatments - and why a request for the "best" education from the school is fatal - read article. Learn about tests, evaluations and assessments. Learn about accommodations, modifications and high-stakes tests. 6. Factors to Consider When Selecting an Expert by Rosemary Palmer, Esq. "When parents choose individuals to evaluate their child, many factors influence the decision-making process - convenience, license or credentials, reputation, insurance issues, office location, referral from a health care provider, recommendation by a friend, family or school employee - unfortunately, even ads in the yellow pages." "A professional license does not guarantee competence. How should parents approach the task of finding competent experts?" Learn about comprehensive evaluations, members of the evaluation team, provision and documentation of services in "Factors to Consider When Selecting an Expert" by parent attorney Rosemary Palmer. You will find more articles about experts, evaluations, and evaluators in the Winter 2002 issue of The Beacon. The Beacon is a multi-disciplinary electronic journal of special education law and practice from Harbor House Law Press. Raising a child with special educational needs can be overwhelming. If you are not careful, special education can consume your life. Many parents drive themselves until they are exhausted and burned out. Pace yourself. Listen to tapes about time management. Use a schedule to gain control of your life. Spend time with friends or family to re-charge your batteries and regain a healthy perspective. Here are more tips for taking care of yourself and your family. Do you want to learn more about special education law and advocacy? Do you want to network with others who share your interests? Do you want to have fun in the sun? Please join Pete and Pam Wright on the From Emotions to Advocacy Cruise II - A Very Special Seminar and Fund-Raiser for Special Education. On Wednesday, January 15, 2003, Pete and Pam Wright will do a full day of legal and advocacy training at the Radisson Resort Hotel in Port Canaveral. The seminar will focus on four areas: special education law, rights and responsibilities; tests and measurements to measure progress & regression; SMART IEPs; and tactics & strategies for effective advocacy. Do you belong to a group that is interested in the cruise? For more info about From Emotions to Advocacy Cruise II, please download and distribute this flyer. What is a FETA cruise like? Read the "inside story" of last year's cruise. Need Help? Visit the Yellow Pages for Kids with Disabilities. Copyright � 1999-2002, Peter W. D. Wright and Pamela Darr Wright. All rights reserved.